Very excellent app for my daughter ( ) March 3 , 2009. My 5 year old is having a good time. Really intuitive. Challenging for my kid and keeps her busy and having fun while learning. 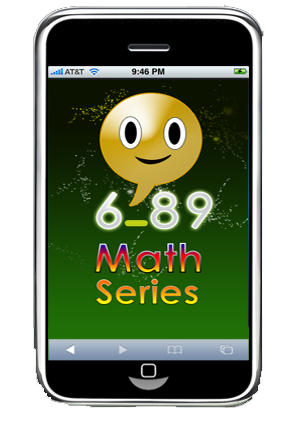 Though there are several apps in Kids basic math category, this one stands out. If your kid is starting out with learning numbers and sequencesm this is a must have. Nice Price, very usable design, colors and sound that motivated kids to use it again and again. I let my neighbors kid play with this, she is 5 and loves it and couldn’t stop playing with it. Math Series is designed keeping a preschoolersi/kindergarten kids in mind. It is very ideal for kids between the ages 3 to 8. 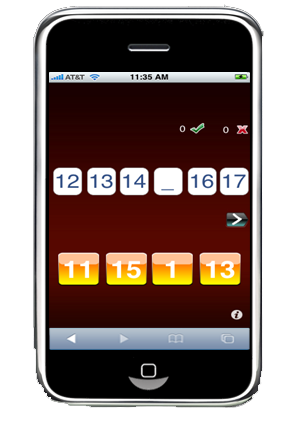 It is an excellent application for kids to have fun with numbers and math. Math Series is very ideal for parents since it engages kids while driving, in the airport or while waiting in the restaurants. This application is loaded with lot of fun features: - Very simple design. Kids need to just select the missing number in the series. - Parents can customize this application to their kids level of expertise. The default setup is to start the kids with simple number series (1's) and after 25 problems (first award), it will advance to next series and so on. 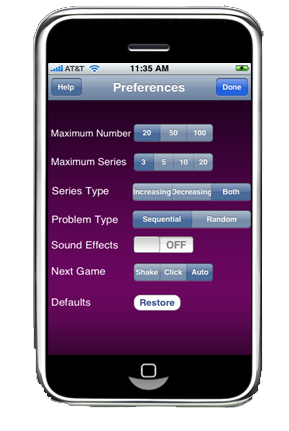 If you choose random the series will be randomly selected. Additional options to setup the maximum start number and ascending or descending options are also provided. - Once they identify the correct answers, shaking the iphone will take them to the next problem. - After every 5 successive correct answers different colored stars appear as their rewards. Kids love this. Like our previous games "math magic" and "word magic", this has also been kids tested and approved :) Considering the nature of this application preferences could changed based on your child's level. 1) Maximum Number could be set to 20 or 50 or 100. 2) Problem Type determines if the number series should be in sequences (1's 2's and 3's and so on ) or in random order. 3) Maximum Series determines the maximum number that could be chosen between the numbers. (This option is valid only if the problem type is random). 4) Series Type specifies if the number series should be in the ascending or descending order or both. In the sequential order, after every award (after reaching 5 stars i.e after solving 25 problems), the series will be automatically incremented. My daughter started learning maths and this is ideal for her to learn while playing..! Please make the numbers on the buttons more visible for the background.